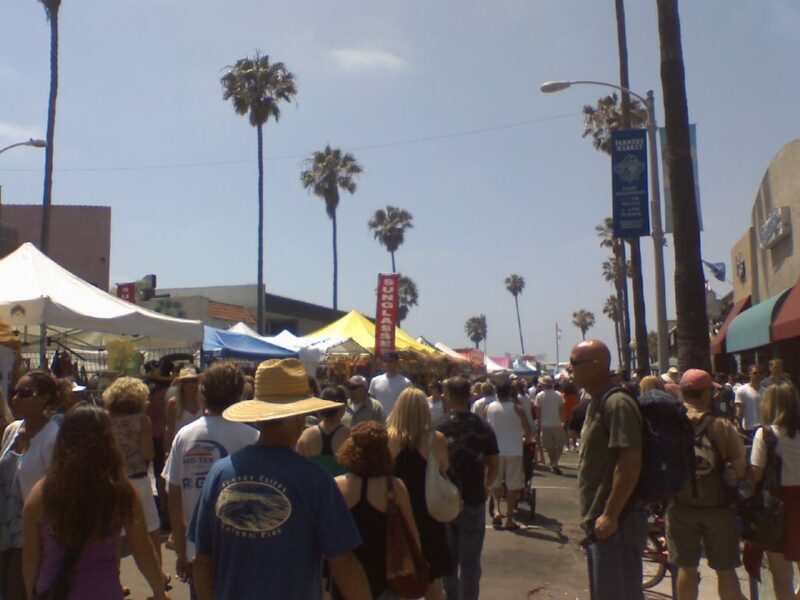 Treated to a beautiful San Diego summer day, thousands of people flocked to OB to take part in the 30th incarnation of the Ocean Beach Street Fair and Chili Cook-Off Festival . Not only was the event a shot in the arm for local businesses and for OB as a whole, but the music was fantastic, the event ran smoothly, and the vibe was electric (at least for OB standards). Everyone in our community takes pride in this event, from the organizers (OBMA and the many volunteers) to the drunken buffoons using their friends as a crutch to keep them from falling face first into the ground. If anything can be said of this year’s event, it is that the expectations for next year’s event are going to be hard to match. As for the vendors, the very people who make this fair the bustling event that it is, it was obvious even before the crowds started showing up around 2:00pm who was going to have a good day. The tri-tips sandwich crew had long lines starting somewhere around 11:30am, so I didn’t even have a chance to ask them who they are, what their secret is, and why their sandwiches were so popular. As someone who does not eat meat, I obviously wasn’t able to try it for myself. But upon asking a passerby who had just purchased one, I was able to gather between chews and barely distinguishable comments (as the guy was really stuffing his face) that the sandwiches are just damn good. When people are lining up to grab a beef sandwich before lunchtime, you know sales are going to be brisk. This was actually indicative of the street fair as a whole. Some vendors seemed to complain that people weren’t spending money, but from being amidst all the hustle and bustle, one could tell this wasn’t true. The crowds sure do have their favorites, recession or not. Michelle brings up a good point: it certainly seemed as if there were a lot of the same things being offered, vegetarian or not. So if you aren’t in the mood for a bratwurst, tamale, or gyro, you are most likely going to be disappointed by the offerings. Even OB’s own burrito joint, Liticker’s, had a very limited menu and wasn’t making their soyrizo burrito – a favorite of OB vegetarians. I guess there is something to be said about the traditions of a street fair and the types of foods that are generally offered, but at an event as large as this one that draws people from all over San Diego it was interesting to note the lack of food diversity. In many ways, that lack of food diversity benefited some more than others. There was a long line snaking down the street of people waiting to get a Hodad’s burger, and equally long waits at South Beach and Newport Pizza. As the lines grew longer at the more popular vendor booth, this seemed to be a more and more common occurrence at every other restaurant on the street. I guess the more time people spent in the sun, the less they wanted a tri-tip sandwich or a bratwurst. When people started opting to visit one of the fine establishments on Newport Avenue rather than indulge in street foods, it put a spotlight on these restaurants and gave Newport’s many businesses some much needed publicity. I guess when you consider that OBMA puts on the whole thing, it goes without saying that exposure for OB businesses is a welcome outcome. TJ, who was manning the Peace Pies raw foods booth, admitted that it probably helped his business for the day. Peace Pies is a regular at farmers’ markets around San Diego, including the OB farmers’ market on Wednesdays, and recently opened a storefront on Voltaire Street. I have always loved their raw foods, particularly the mock tuna wrap – which is what I ended up eating for lunch. One vendor, who had yet to sell much of anything by 3:00pm and will remain anonymous, was not happy with the way things were going. Of course, this vendor was right. There was definitely more traffic between the pier and Cable Street, and seemingly much less action between Cable and Sunset Cliffs. I guess location is everything when selling a specific product or food, and for this event the closer a vendor was to the beach, the better their sales would be. What would an OB event be without some quirky booths? 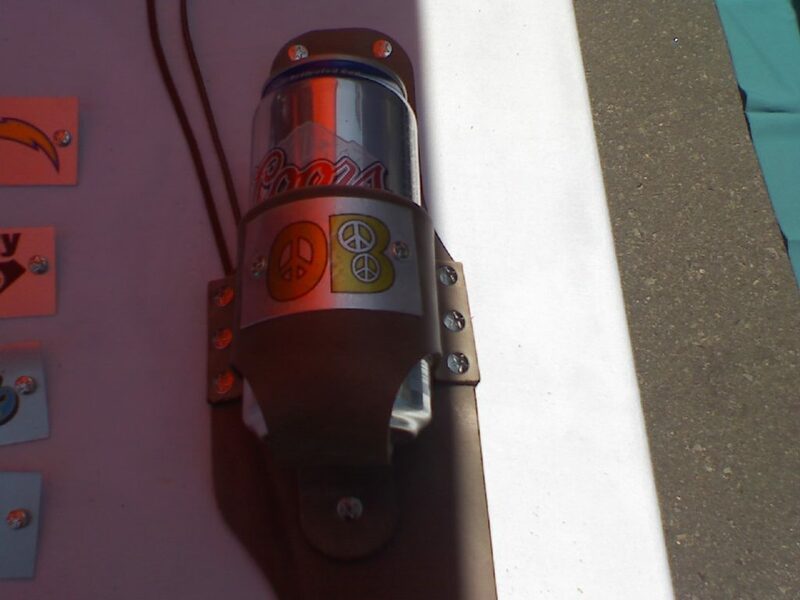 One interesting product being hawked from a booth on Abbot Street across from the Chili Cook-off area was leather gun holster-style beverage holders. While not specifically based in OB, the company that sells them, BeerOutlaw.com, is based in San Diego and the product seems to do really well as a kitschy, niche market gift item. Had the booze ban not been passed, you would surely see plenty of people walking around the beach with a beer or other adult beverage ready to be drawn on a moment’s notice. Dave Brecht, the owner of the company, offers customizable buckles that can be attached to the front of the holster – and was quick to point out the many he had brought to sell that had “OB” emblazoned across the front. I don’t know how sales were for the day, but they sure seemed to have fun selling the product. Similarly, the guys hawking Belligerent Active Drinking Gear seemed to be getting lots of attention. Morgan, who lives in San Diego and calls himself an “avid drinker”, utilized a bullhorn to harass and threaten passersby who didn’t take notice of their booth selling satirical gift items targeted at bar hoppers and night-clubbers. Again, I don’t know how sales were, but these guys seemed to be having a hell of a time. Personally, I think they were pretty funny. Anytime people have that much gusto, they fit in pretty well in OB – regardless of what the offended parents or church groups in the surrounding booths seemed to think. Community oriented booths were very visible at the fair, as would be expected in OB. Some notable groups represented were the OB Town Council, the OB Historical Society, and obviously the OBMA. 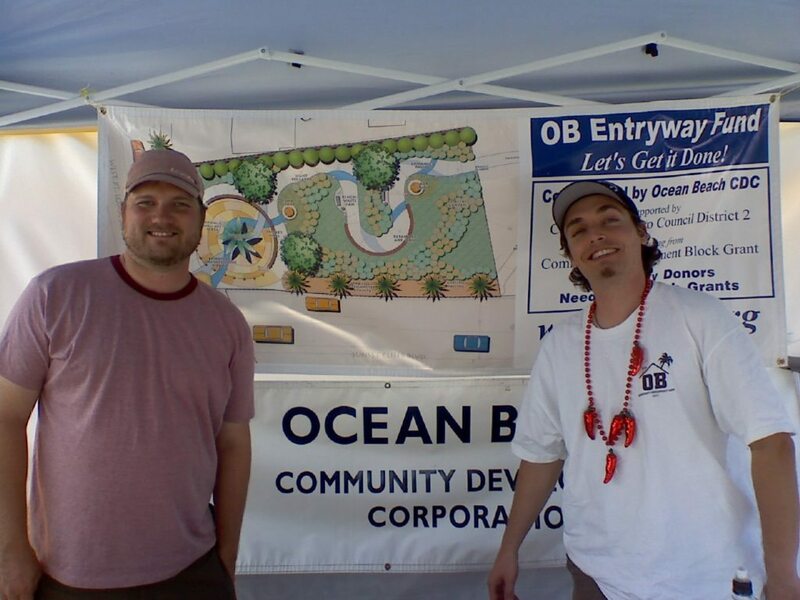 While walking around I happened to stumble upon two friends of mine, Luke Sponsler and Khristopher Tabaknek, who both work with the OB Community Development Corporation (OBCDC) and were volunteering their Saturday to educate OBecians about what the CDC does and how far along the Ocean Beach Entryway Project has come. Luke, who had been at the chili cook-off earlier as part of “Team Hettiwanda”, seemed surprised at how interested people have become recently, due to the signage detailing the Gateway Project that was recently erected in the project’s target area. 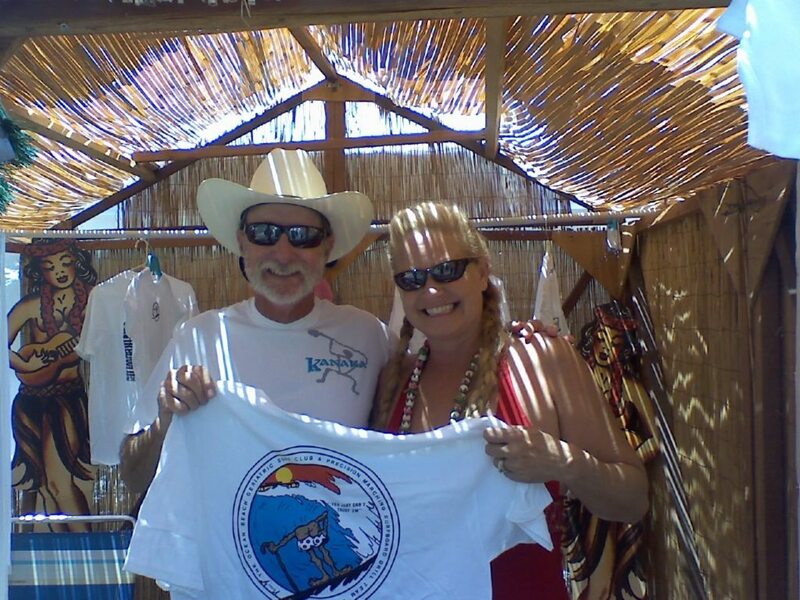 As in many years past, Uncle Mikey and Deborah Henderson were in attendance representing the OB Geriatric Surf Club, selling t-shirts and other items to support their organization. Known for their highly energetic public activities, such as the drill team they put together for the OB Christmas Parade, Deborah- aka Skates – explained what their fundraising efforts have paid for in the past. As I walked down the street, scribbled some notes in my notepad, and put on my party hat, I couldn’t help but think of how unique the OB Street Festival really is. When you attend expecting to get drunk, listen to music, and have a good time, it is very easy to overlook all the people that make the scene what it is. Obviously, those who organize this event have it down to a science, and the OBMA should be commended for running such a clean, tight ship. In the end, however, it is the vendors and the connections they make to the attendees who give the street festival its distinctly “OB” vibe. At a time when many people are struggling to get by, there was definitely a lot of people spending money that they probably don’t have. By providing an atmosphere where people can feel comfortable enough to forget about their troubles, the event is bound to be a success. Whether or not every vendor goes home with a profit, at least they can say they were a part of something bigger than dollars and cents. As people in OB have been saying for the last thirty years, there’s always next year. you damn vegetarians are always bitchin. I stopped at the OBCDC booth too, and introduced myself. Tom Perrotti spotted my OBRag Press ID and was surprised to hear that the OBRag is still around. Viva La OBRag! Omnivore though I am, I feel you on the lack of veggie-friendly foods…and the general lack of diversity. Lots of typical fair fare – I managed to fill up sampling chili, got my daughter some junk food goodies but didn’t really blow a lot on food. Most of my duckets were dropped in the pockets of artisans, got some trinkets for the kid and girlfriend and some cool photography for the house. I also saw Spinach Pie sold which I personally always find satisfying too. And I believe you could get the Asian noodles without meat. Wasn’t there also a corn on the cob vendor? Vendors who sign on early; like sending in the renewal form as soon as they get it will get first dibs on placements. A LOT of vendors do this and for good reason. Obviously after 30 years there’s a lot of repeat vendors- and we believe in being reciprocal in and with good will. Vendors often apply to various Fairs in the area and like to see if they’re accepted at other events first. When they’re not, they look to fill those weekends, so by that time they’re probably late in the game even if they’re within the cut-off date, the choices spots are taken by those who decided early to be a part of the OB Street Fair. If you see some great vegetarian vendors at other events, tell them they should be in the OB Street Fair next year and to contact the OBMA! As long as there’s space I’m sure we’d love to have them. Great piece Lane, it was cool catching up with you on Saturday too! I think it was pretty obvious that OBMA did everything within its powers to limit redundancy, so I guess if something different pops up they will have a good chance of getting in next year? Part of the problem for some people, I am not wholly included in this but do understand the point of view, is that using a grill to cook meat and veggie foods on kind of defeats the purpose of not eating meat in the first place. Again, I personally am not that picky – but a lot of veg heads are, and obviously in such a small space its hard to have “separate” cooking spaces. Anyway, the truth is that my “complaints”, while valid, are miniscule as compared to the big picture. This event was and is awesome, and will continue to be a big deal for as long as its going on. I want to reiterate too that the publicity and customers the fair brings to the businesses on Newport is great for them and great for OB…especially now. gotta love those drunken buffoons. I REALLY miss Roots cafe. I’m not a vegetarian, but those girls made some ridiculously good rabbit food. Instead I sampled about 12 different chilis and ate a cheesesteak and a pizza throughout the day. I’m finally starting to feel normal again on Tuesday morning. Ah…gotta love the street fair. it would have been cool for roots to be at the street fair. I know carianne and I really miss their food. There you go again Lane, thinking that you know what everyone else is thinking and “attempting” to represent a community you’ve barely gotten your feet wet in. Well, you’re dead wrong on one account, this local doesn’t share the sentiment that “Everyone in our community takes pride in this event”. Quit trying to be a journalist, and actually be one. But o.b. native, you raise an interesting question about how we judge the validity of perceptions. Are any of the following capable of providing a valid perception about the street fair: a tourist from Mississippi? Someone from El Centro who lived in OB and returns every year? Someone from Clairemont? How long does someone’s feet need to be wet before they have the right (?) to report or opine about a community? Annagrace – is that “joint-ism”? And, if not the street fair, what local events DO you take pride in ob native? The xmas parade? The dog walk, kite festival, pancake breakfast, shall i go on? Or do you just sit home and gripe about all the silly events in ob that you aren’t proud of? The street fair is a long standing tradition here. To say you don’t take pride in something beneficial to the community and then start calling out people on a local blog for “barely getting their feet wet” seems a little pretentious to me. Relax dude. Your gonna give all the friendly locals a bad name. Lane is a great guy and a very welcome addition to our neighborhood. Please let us all know what you do to contribute to the betterment of the Ocean Beach community? That too, Molly. We take pride in being multi-dimensional! So let me get this straight native – apparently I cant write about OB because I’m not originally from here and haven’t lived here long enough, I cant make a complaint about the food at the street fair since I dont eat meat, I cant be a blogger because I’m supposed to be a journalist (whatever that is), and I can’t have an opinion because when I say something it inadvertently represents the thoughts of every person who lives in OB. I want to thank you for reminding me why I’m a writer. Lane understands the spirit of Ocean Beach, that’s obvious from his writing. He may not be a native, but he’s definitely a local. my point isn’t whether i personally take pride in the street fair. if you actually Read my sentence, you will see that. “this local doesn’t share the sentiment that “Everyone in our community takes pride in this event”.” what i am pointing out is that generalizations aren’t truthful; in this case i doubt that Lane polled “every” resident. when a writer makes such broad implications that “everyone” is doing something, they are grossly incorrect. face it, this isn’t my personal take on things, rather it’s the way fair (and correct) journalism (okay Lane, since you say don’t know what journalism is, we’ll use the big word “blogging” for your clarification) is produced. “I want to thank you for reminding me why I’m a writer.” you’re welcome. ob native – thanks for having a sense of humor. We all need to. i dont think everyone who contributes to this blog claims to be practicing fair and correct journalism, although some definitely do. I sure dont; my writing is extremely slanted and partial. I openly admit that. So I apologize for making a gross generalization and offending you personally. This blog represents what has become the new age of media, which is to say the OB Rag is not the UT, or the LA Times, or any other major journalistic outpost. If you want that kind of stuff, this blog is not the place for it. If the Rag charged money to subscribe, I could understand why you would be upset when a writer breaks a cardinal rule of journalism. For the record, Ive taken a number of “journalism” classes throughout my life, spent time at traditional media outlets, and graduated with a degree in from a communications program at a college that churns out contributors to major newspapers and television news stations year after year – so I know what journalism is, contrary to what you may think. Based on all of the above, maybe you can see why I’m a social worker for a living, and not a journalist. The statement that probably stood out the most to me was “there you go again”. Clearly I’ve offended your sense of journalistic integrity more than once, and probably will again. So I apologize for those instances, and future ones as well. keep smilin’, telling the truth as best you can, and, above all, truckin’! So, your paragraph, and especially the last sentence in it ” For the record, Ive taken a number of “journalism” classes throughout my life, spent time at traditional media outlets, and graduated with a degree in from a communications program at a college that churns out contributors to major newspapers and television news stations year after year – so I know what journalism is, contrary to what you may think.”, doesn’t quite make sense to me. i was simply reiterating something that you had pointed out in an earlier post. i apologize for my earlier quip “there you go again”. it was not needed and might have felt mean-spirited, which was not my intention. okay, okay, will you guys just kiss and make up, for crissakes. o.b.native- Good talking to you! sometimes when you write something, it means more to the reader than the writer intends – and thats why its great that we have the comments section, so readers can voice that. Good lesson for me going forward. Sorry about the back and forth. my last post . . . for now . . . you guys (and women) are down right decent people. i’m learning big stuff here. thank you, each of you, for that. peace and a smile. ob native – c’mon back any time. we all enjoy the back and forth, as most of us enjoy the in and out.